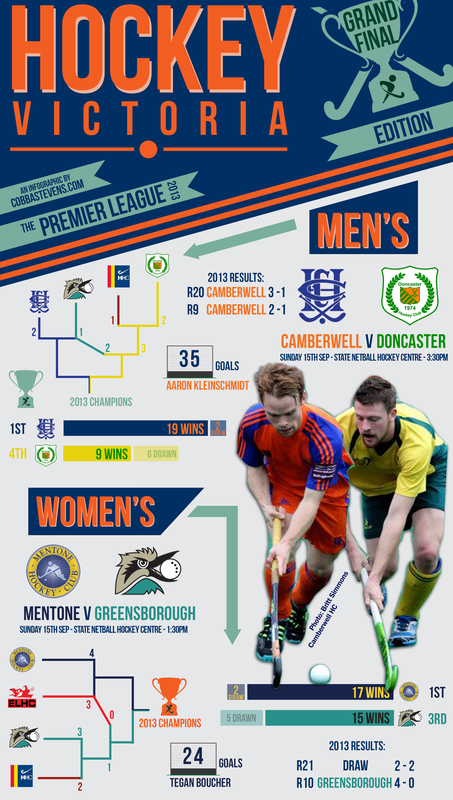 Today, the 2013 premier league hockey season comes to a close with both men’s and women’s leagues showcasing the grand final at the State Netball Hockey Centre, Parkville. In the Womens, Mentone (1st) will face Greensborough (3rd) in which looks to be a thrilling fight to the end. Greensborough have a chance to make history, by becoming the first women’s State League/Premier League club to win three premierships in a row. While 2012 runners-up, Mentone, will have the chance to bring home a State League/Premier League women’s trophy for the first time in the club’s history. In the Mens, Camberwell (1st) will play Doncaster (4th) in what is a replay of the 2009 Grand Final Doncaster defeated Camberwell 3-2. Doncaster is looking to have a better start than last week, sealing the preliminary final win after a late burst in the final 20 minutes of the match against 2012 premiers, Greensborough. However, Camberwell have been favourites all year, dropping just 1 game under men’s All Star coach, Andrew Henderson.